On October 15, 2009, United Kingdom Border Agency [UKBA] officials took Adeoti Ogunsola, a ten-year old girl who attended a primary school in Gillingham, from her aunt’s home during an early morning raid. Adeoti had been one of 1,119 children placed in immigration detention when her family was detained in the Yarl’s Wood Immigration Removal Center [IRC] earlier that year. At the time, a psychotherapist warned that Adeoti was suffering from complex post-traumatic stress disorder as a result of the detention and that, if detained again, she might attempt suicide. Following the raid, Adeoti was taken to Tinsley House IRC, where her mother was already being held. Staff later found Adeoti in the kitchen trying to strangle herself while her mother was asleep. More recently, on January 11, 2017, a 27-year-old Polish detainee was found hanging in his cell at the Morton Hall IRC. He had been refused bail, a decision affected by the absence of a guarantor. His girlfriend, heavily pregnant at the time, was unable to travel to the remote center to attend the man’s bail hearing. Whilst detention under immigration powers is supposed to be a last resort, thousands of people – often desperate and vulnerable – are detained every day across facilities in the United Kingdom, and the population is growing. 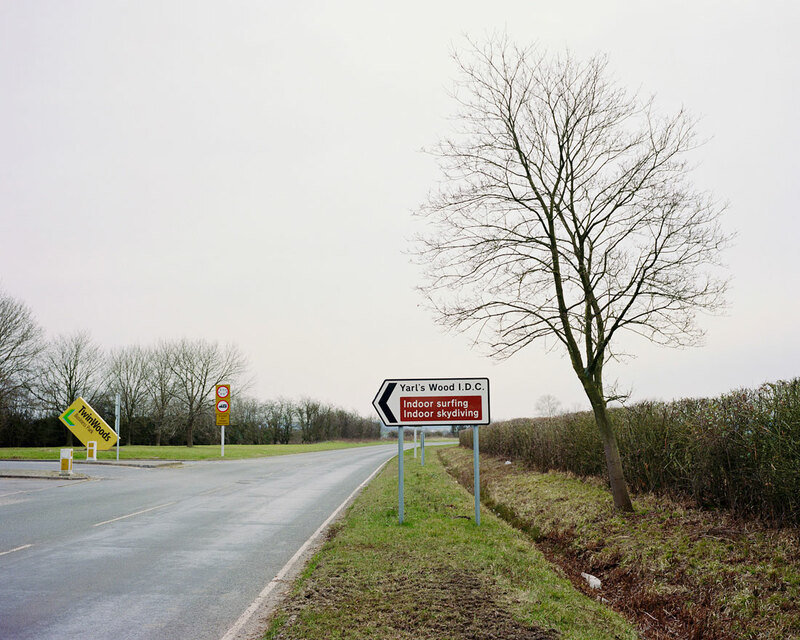 Over the past two decades, the UK’s immigration detention estate has grown by almost 1,500 percent. In 1993 there were just 250 places in which immigration control legislation could see someone held in custody; today the detention estate has 3,617 places. Immigration detention in the UK can be defined as the practice of holding a person subject to immigration control legislation in custody whilst they wait for either permission to enter the United Kingdom or their forced removal. Immigration detention is not the result of any criminal proceedings, and is not overseen by any court or judge. Under the Immigration Act of 1971, and several subsequent laws, the state has the power to deprive migrants of their freedom for as long as takes for the competent authorities to decide their status. There is no time limit to this sort of imprisonment. 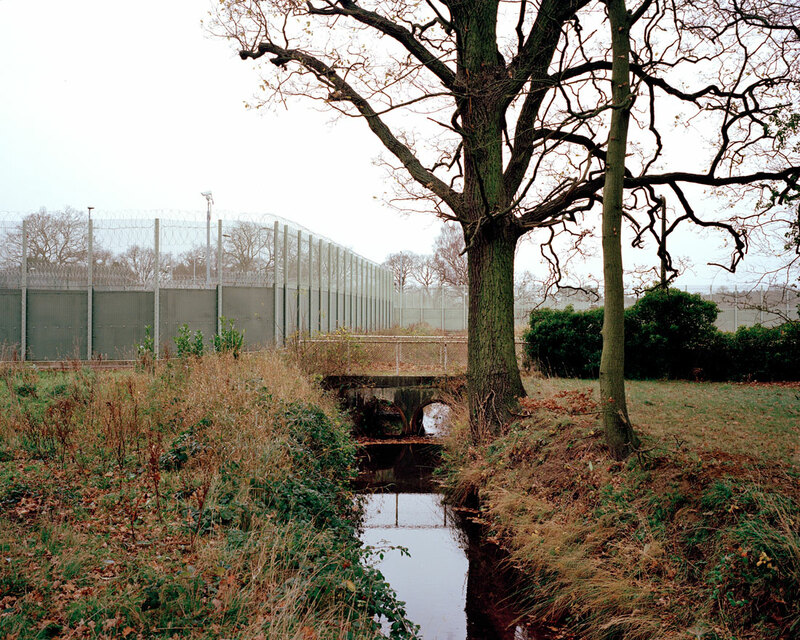 The UK operates 11 sites that are used to detain people for more than 24 hours – one of the largest networks of immigration detention facilities in Europe. There are nine IRCs used for long-term incarceration, and in 2016, almost 29,000 people entered immigration detention. Morton Hall occupies the site of a former prison and is run as an immigration detention centre by the Prison Service on behalf of the Home Office. Prior to that, it was a base for the Royal Air Force; it occupies a vast portion of land, surrounded by sparse woodland, and ultimately by the arable land of Lincolnshire. The current complex has inherited several features from the old military base, from an oddly-shaped layout with irregular boundaries to the disposition and dimensions of aircraft hangars. On the Southern side, outside of the detention area, there is a small, inaccessible lane lined with two-story houses that were previously inhabited by the families of prison guards. An imaginary view from above could rewind the gradual transformation, and then fast forward it, interactively moving gates and roads, modernising security mechanisms as the years go by: weapons in use, protocols and, of course, uniforms. Morton Hall is the only IRC to have completed its functional cycle, and symbolically recomposes the continuity line between the Military- and Immigration-Industrial Complexes. At Twinwoods Business Park, near Milton Ernest, Bedfordshire – a small village about 60 miles north of London – one can find Yarl’s Wood IRC. The business park’s varied tenants – Bedford Pets Crematorium, an office of Bedford Borough Council, the headquarters of a company that offers indoor skydiving, a transport company, a storage facility – epitomise the adaptability of such buildings. Underdetermined by their physical structure, they are easily appropriated, divulging few clues as to the practices unfolding inside. 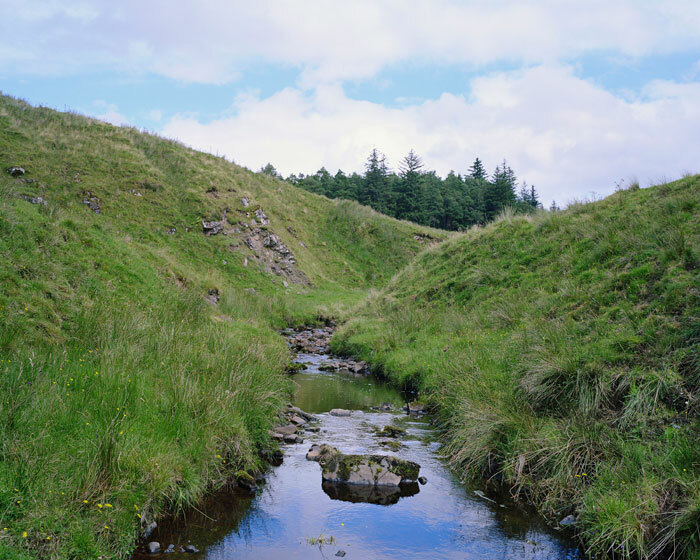 These are places for those activities that somebody has felt the need to perform, somewhere, at a certain address, but not necessarily within our field of vision. It is within this context that the detention facility, occupying the easterly corner of the park at the end of a cul-de-sac, behind secondary security barriers, can exist unchallenged. Yarl’s Wood opened on November 19th, 2001. Built to hold up to 900 people, it was the largest IRC in Europe. Three months after opening, the £100 million centre was ablaze; the fire, started during a protest by detainees, destroyed half the complex. It reopened in September 2003 with a reduced capacity of 410, dedicated to detaining family groups and single women, and hosts one of the largest concentrations of women deprived of their liberty anywhere in Western Europe. 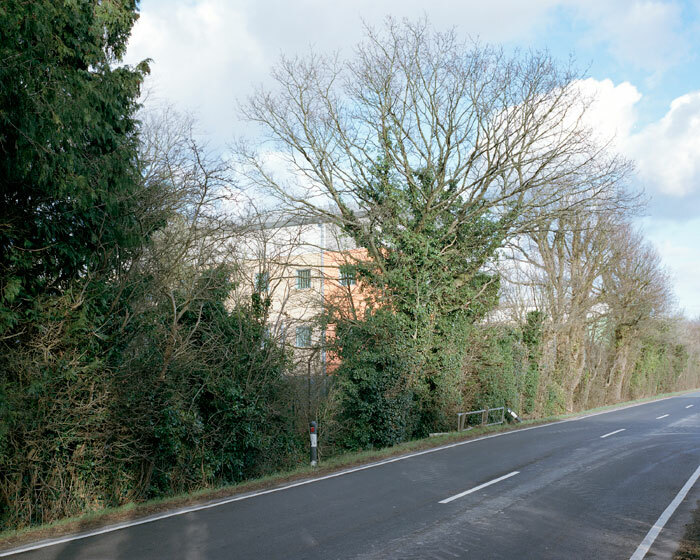 The route to another IRC, Tinsley House, beside London Gatwick Airport, is characterised most sharply by one’s relationship with the airport’s perimeter. Via fences, gates and barbed wire, one can be moved seamlessly from an airport exit to detention. From Tinsley House, one can (if authorised) continue west along the Perimeter Road South to Brook House, an IRC adhering to Category B prison specifications, where up to 448 people are detained. In such a way, Perimeter Road South links travelling with detention, without ever crossing the boundaries of the airport itself. Outside, on a public road, Charlwood Road, which runs parallel to Perimeter Road South for a while, you’re offered the only permissible point to view Brook House, through and above the hedgerow. Controversies involving G4S are as wide-ranging as the services it provides. The company first faced the wrath of the UK public following its inability to adequately staff the London 2012 Olympic Games; G4S Public Services workers at Lincolnshire Police 999 call centre massaged performance figures; inmates in Birmingham Prison, managed by G4S, were locked in their cells for almost a day when the keys were lost; guards at Medway Secure Training Centre – a children's jail – were videoed hitting, choking and verbally abusing children in their care. In September this year G4S suspended nine staff from Brook House after undercover footage, obtained by BBC’s Panorama, showed officers mocking, abusing and assaulting detainees at the facility. Operator: The GEO Group UK Ltd.
Each immigration detention center has a unique layout and adopts its own security protocols. 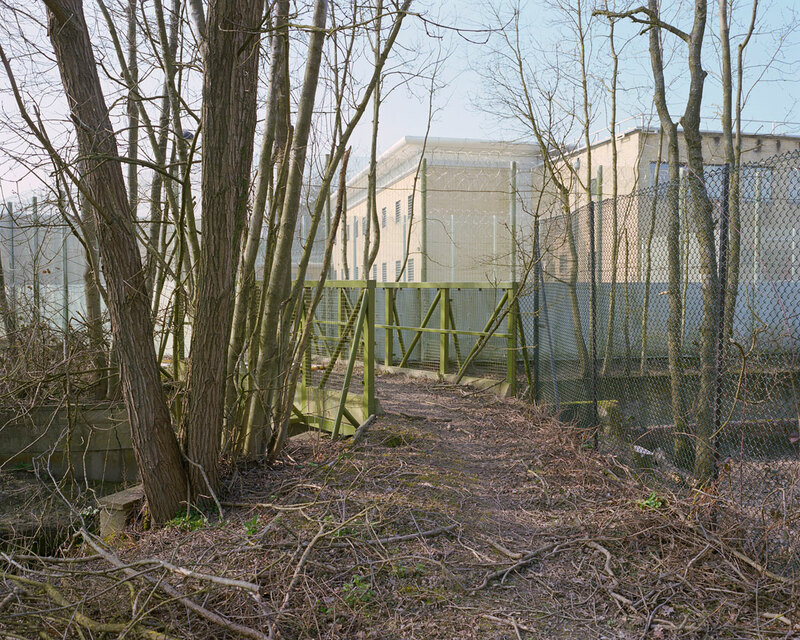 At Campsfield House in Kidlington, Oxfordshire, inmates are allowed freedom of movement within the center until late at night; Brook House and Colnbrook, a facility at Heathrow, follow the security guidelines and architectural layout of Category B Men’s Prisons. At Morton Hall detainees are locked up from 8:30 p.m., staff carry batons and detainees are handcuffed before being escorted off-site for any reason. Practices here have been deemed inappropriate for an establishment detaining people who are not being held in relation to any criminal charge or conviction. Across different private contractors, there is still no shared statement of values governing the management of immigration detention centres. In an era in which private interests and discriminatory legislation that articulates the infrastructure of segregation and surveillance has become commonplace, IRCs can appear to represent a smooth line of continuity with the fields, fences, homes, businesses and transport hubs in their midst. This smoothness first hides removal centers in plain sight, and then obliterates the question of access: Received notions of belonging and exclusion have been normalised to the point that we forget to dispute the very idea of detention itself. 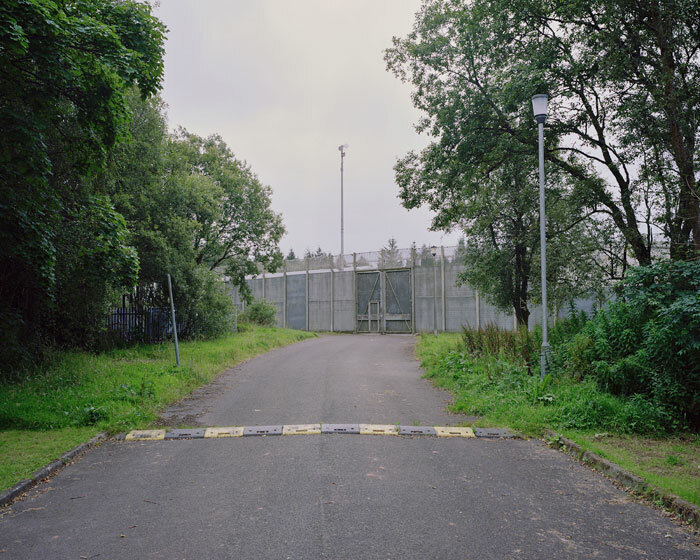 This article is excerpted from Removal: A Short Guide to the United Kingdom's Immigration Detention Estate. Click here to buy the entire publication. Silvia Mollicchi is a writer and PhD student at the University of Warwick, based between Coventry, England and St-Erme, France.